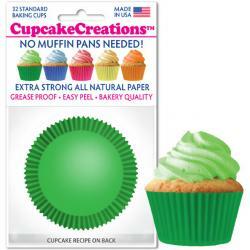 Green colored shamrock shaped confetti - perfect for St. Patrick's Day cupcakes. Ingredients: Sugar, Rice Flour, Partially Hydrogenated Vegetable Oil (Cottonseed & Soybean), Corn Starch, Gum Arabic, Cellulose Gum, Confectioner's Glaze, Yellow 5, Carrageenan, Soy Lecithin, Blue 1 and Artificial Flavor. ALLERGEN INFO: CONTAINS: SOY .This product is prepared and packaged using machines that may come into contact with WHEAT, EGGS, MILK, SOY, and TREE NUTS. Shamrock Cookie Cutter - 3"